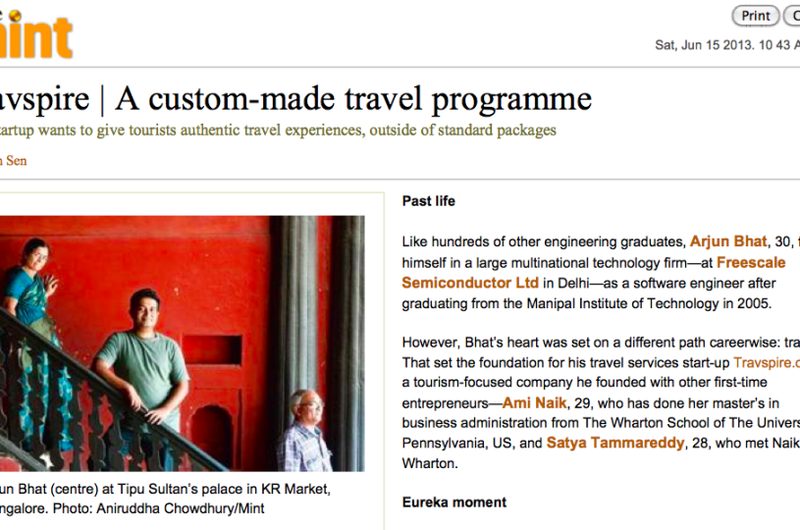 Like hundreds of other engineering graduates, Arjun Bhat, 30, found himself in a large multinational technology firm—atFreescale Semiconductor Ltd in Delhi—as a software engineer after graduating from the Manipal Institute of Technology in 2005. However, Bhat’s heart was set on a different path careerwise: travel. That set the foundation for his travel services start-up Travspire.com, a tourism-focused company he founded with other first-time entrepreneurs—Ami Naik, 29, who has done her master’s in business administration from The Wharton School of The University of Pennsylvania, US, and Satya Tammareddy, 28, who met Naik at Wharton.